This book is a revised version of my Ph.D. dissertation that was submitted to the Massachusetts Institute of Technology in 1983. Although much of the analysis and argumentation of the dissertation has survived rewriting, the organization has been considerably changed. To Paul Kiparsky and Morris Halle, lowe a major debt. 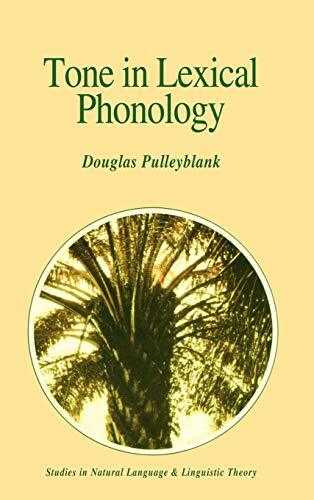 Not only has it been a great privilege to work on phonology with both of them, but it is hard to imagine what this piece of research would have looked like without them. (They, of course, may well imagine a number of appropriate ways in which the work could be different had I not been involved .... ) In addition, special thanks are due to Ken Hale, the third member of my thesis committee. Our discussions of a variety of topics (including tone) helped me to keep a broader outlook on language than might have otherwise been the result of concentrating on a thesis topic. Sutton Books is an ABE 'Heritage Bookseller,' trading by email almost exclusively since 1995. The proprietors travel extensively and have bases both in the USA and the UK. Our specialty is books in religion and theology, but we stock all academic subject areas and seek to serve the academic community with books of scholarly interest and usefulness. cheques. We also take VISA, Mastercard, American Express, and PayPal. Shipping and handling by media mail is $4.50; Priority Mail shipping and handling is $6.00. Multiple orders shipped for the rate of single. International Priority Mail is $26.00. Tracking information is included free on orders. We ship internationally as well, and do our very best to ship within 24 hours of confirmation of order.